I have many questions, but I know that they all come from the same source. I need you to clarify where to start again. Can I trust my intuition, am I following my mission? How to identify if I am being guided by the ego or the heart? You still have grief. So what do I do about my brother's death? What to do about the love that is gone, should I still get it? Your messages have been balm in my journey, I love you, and I am very grateful! My beloved daughter, how many questions for few answers. The questions are so simple, but they are the ones that lead us to walk, to seek, to seek. But to respond we need to bring them to our heart, to our center of love, where we understand life from greater ease. I wanted to tell you daughter, who needs to seek her silence, because her mind is restless and therefore distances herself from what is her purpose. We only meet when we are silent and thus allow the love of our heart to radiate to the world. Seek your silence daily, go quietly to meet it. This is the first step to understanding ourselves, when we are already able to be silent within ourselves and we can feel what we are. It is a process that in the beginning will not have so many effects, but progressively you will see the result that will manifest in your life. Silence! Calm down! And within that silence expand. Find your peace from your silence, which is when all the answers will be brought to you, but not in words, but by the peace of your heart. From peace, the answers will come through the feeling of faith and hope, where the now will be beautiful. I am 76 years old, married and have 5 children and 10 grandchildren. I am very worried about everyone and I also worry about the people around me and even the people I do not know. I have a lot of financial worries, because my husband's business and income are small, and even the businesses that appear do not materialize. I have depression and sometimes lack of courage in the face of life. Daughter, I'd like to tell you something today. To say a few things you need to understand. Life on earth is an incessant search for our happiness and for those around us. But because of the apparent separation that you have included, you seek happiness, only for yourself, which reflects in the concern for the happiness of those who are close. But deep down all happiness is sought for itself, because within this illusion, you can not see yourself in oneness with the whole, yet. In this partial, human vision, I would say, without the situation, you end up in this quest and worry about your own happiness and your family members. But see that it is not a concern that demonstrates the genuine love that liberates and allows each one to follow his path. You forget that all are equally children of God protected by the Father. So notice that much of what you understand for love in the background is attachment. Because you do not truly love to the point of releasing and trusting, if necessary, but you want the person for you, living your own happiness, because there you see an opportunity for personal happiness from the other. In this earthly experience, then, several concepts were being modified. See that the love you feel is not the true love that goes from the inside to the outside, it is a love that sees in the external object, in the brother, a possibility of having a little happiness. So you live your days thinking loving, thinking to feel, to move, but are thoughts and not feelings. The real feelings that start from the essence do not need any external condition. They are pure and radiate from within. See that the thought projects happiness into something outside (its children, grandchildren, husband, money), but the true feeling is independent of the object that generates it, because it is an achievement, something that starts from inside and internalizes. You do not love an outer object or a person, but the feeling that brings them. If they do not agree to release their brothers, their relatives, to life, because who loves lets go and trusts, does not arrest. But I say this only so that you understand that we often throw our happiness into something external to us, money, a company, the goods of life, and we think only of being able to be happy and loving if we are in possession of the person or what we think Need to find happiness. But real happiness is precisely the absence of dependence on everything external to us. For this reason life in matter leads us to situations of great inner challenge, for this leads us into our interior, for when we no longer have the object of our desire we discover that this feeling has always been within us. He was always there, but we understood that we were dependent on something external that generated us what was a thought, not a feeling. In this situation that you live you believe that your peace depends on the way your children, grandchildren, and husband are, if you are in what you mean by comfort, you are happy. But when everything goes out of control happiness goes away. But if you understood that the peace and love you have within you is your natural state, this is you, you would see that you have always had everything in your life, regardless of anything that leads to insecurity or destabilizes you. You have this peace alone. All that is around you, then, are experiences that show you how strong is the feeling of peace within you, of love. It is very easy to radiate your peace and your love in a safe and secure environment. But the proof is to discover it independently of something external, for it is its purest essence. The day you discover this peace, this state of being, you will find great joy in your life. Persevere my sister, seek within her your peace, that you will see what it is capable of accomplishing from that inner state. May my sister be in peace. 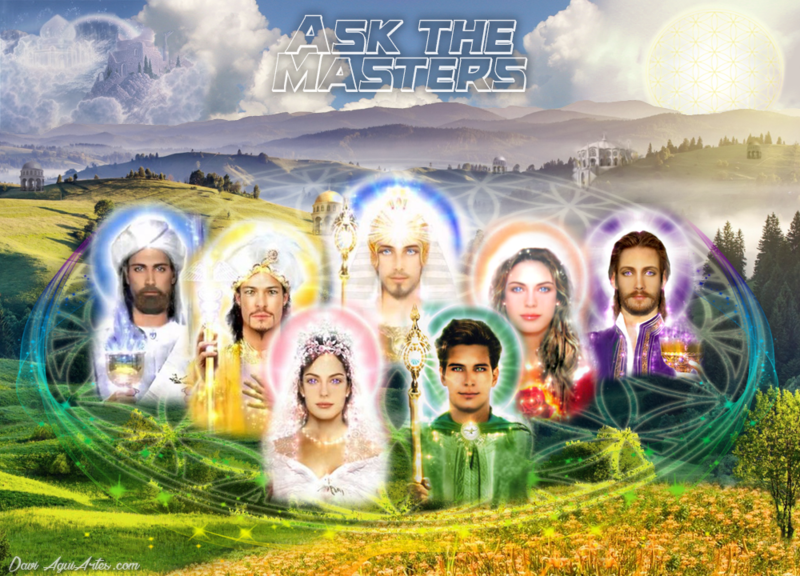 Dear Masters, it is with great gratitude that I hope to have a light for my question. I, the Masters, in this incarnation, have the feeling that I have chosen to come to solve everything at once, for I have already suffered painful sufferings, but nevertheless I kept my heart always for help and overcoming, it was not easy, but really , The force that I thought often did not have, I was able to overcome very slowly. There were times in my life that even heaven or heaven I wish I did not exist, because even that did not give me joy, but with the help of the whole family of light today I am in peace, I have overcome the emotional part of relationships, I've been alone for a long time. I do not know if I'm going to be alone, but it's not an issue that bothers me, I accept whatever has to be. But there is one issue that I do not know how to solve, which is the financial level. I've been to the bottom of the pit, out of work, with bills to pay, and today I'm employed, I do what I like and I have an immense gratitude for everything I have and even everything I went through, but my question is: I'm in a company and I have a colleague who came in at the same time as me and earns more than I do, I wish I could have the same order as him, I do not know if I should speak directly to my boss, because I already talked to my boss and He does not call me, or should I let it flow and wait? This part of the money is the one I feel there is still some fear and some resistance as it continues to repeat. If the cycle of lack, of lack, I ask a light an orientation to be able to clean and transmute this my repetition, I thank with all my heart this opportunity. Namastê! Beloved, see how much you suffer today because of your inner dissatisfaction with what life can offer you. You went through situations that were difficult for you, and today you live in a God-given situation, but still, do you want more, my beloved? There is no harm in this feeling, my dear, it is very common in the society that you live today, but this feeling of dissatisfaction is simply the lack of the inner search. The quest for external satisfaction, for loving companies, for better wages, is only something that is lacking within itself, but which has not at any moment chosen to seek, my dear. Life will always present you with repetitions, for in truth life is simply repeatedly bestowing you with many blessings that you can only perceive as difficulties. You see my love? It's very simple, my dear flower. You just have to seek your inner truth. Focus on your spiritual elevation not to reach heights of elevation, but to find that joy and feeling of completeness that is already present in your life, but can not perceive. Meditation, the search for your truth, will bring your answers, my dear. I just tell you that your quest is only internal. Be okay. With love. Dear Masters, for nine years I have lived a complicated relationship, in fact this man has remained during all these years, relating to me and other women. I've tried to get out of this relationship several times, but this man can always convince us to stay with him, surrounds us with his lies and false promises. A few days ago I decided to finish this once, but he kept following me insistently saying that he regretted everything he has done to me and that he wants to have a serious relationship with me and that he promises to change and be different. Honestly I'm on the tightrope, because I know I like him a lot, but I'm afraid to give this chance and regret it bitterly again. Please, help me, I do not know what to do. Gratitude! My beloved sister. Need to ask yourself why you submit to something that does not make you happy, because you accept something less than you could have? Do you feel unable to be loved, to be happy? Seek within yourself the insecurity of being alone, the difficulty of being full and of finding your self-love. You do not need to accept, let yourself be deceived, live an unreality only to have someone by your side. You have everything you need within you and you may feel loved if you allow yourself to be alone for the time needed to strengthen yourself. We will never tell you what attitude you should have, but I believe that here is an indication of the path, which is to strengthen first before you accept something that leads you back to the cycle of suffering. You must break with this cycle, my sister, and the way is to understand yourself as self-sufficient, to learn to be good with yourself. From this inner feeling you can then build relationships of mutual empowerment where you can then give and receive the love you keep in your heart. But this will only be possible when you give yourself enough time to learn to be well with yourself. Good Morning. I am 53 years old, married, three children. 1- chairman, 2- lawyer, 3 - married, economist. My life is not easy, everything I do is not going forward, I currently do handicrafts, but it does not sell, it's very difficult. I have depression and for many months I have been struggling without being able to sew anything. Is this the path I must follow to be financially independent, for that is my greatest desire. Please give me a light, a way. Thank you, thank you! Beloved sister. I see you involved in situations where you do not find an abode for your heart and for the tears that fall, as you observe the life following for your children, and for you, who has the heart of a mother, you begin to see yourself. You are each following your life journey, my daughter, they will not leave you helpless. So, my sister, focus on doing what you love, but do truly putting love in your work, even without expecting financial retribution. This journey, daughter, shows many paths fueled by fear and pain. But you, standing firm in the work with love, persevere. Only, my dear, be true to yourself and allow your life to always be carried transparently, for the work done with love will always yield good results. Follow your heart my sister.